Smarter Service Delivery (SSD) is an innovative project run within Carlisle City Council. The project focuses on making improvements to the way customers access our services. We want to make digital services so good that people want to use them. Digital is not the only option. We are very aware that online isn’t always the best place for everyone to access our services. Customers will still be able to access services via other channels. Whichever channel they choose SSD will ensure that the service they receive is efficient, effective and above all customer centric. 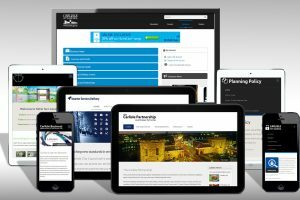 We have created a blog on the new site to share good practice with colleagues and the general public nationally: http://www.carlisle.gov.uk/ssd_project/What-is-Happening. Users can leave feedback on what we can improve and what we can add. We are working with other City Council projects such as City Centre WiFi. We have put self-serve kiosks into Community Centres, Contact Centre and Tourist Information Centre so that users can access our services if they do not have a device. What makes this initiative remarkable? • Launching a new responsive website with 27 new end to end online transactions currently available. • Launching 6 new mini sites at the same time. • Developing My Account with 7000 customers currently signed up allowing full integration to service requests. • Increase in fully online transactions from 19% to 31% in the first week and growing. • Responsive to various devices and smooth operation on various operating systems. • 1000 online waste requests completed in first 3 months of introduction. Zero to 28% of queries now taken online. • 90% of Direct Debit’s for Council Tax now online. • Entire project delivered in-house minimising costs and retaining control. Services working across the authority together with a mutual aim. • Dedicated site for open data and planning policy. • Online blog sharing good practice nationally. • Using inbuilt analytics for intelligent monitoring and use of data. • Providing services online has enabled us to reduce resources where appropriate.